While the majority of rhinoplasties are performed to reduce the size or refine the shape of the nose, there are instances in which nasal implants are required to build up or reinforce the nasal structure to achieve the desired outcome. This guide will help you understand why nasal implants are used and what materials they can be made from. A plastic surgeon may recommend a nasal implant for a variety of reasons. In general, nasal implants are indicated when the purpose of the rhinoplasty is to increase the nasal profile, reinforce weak areas, or correct areas of previous damage due to illness or injury. Nasal implants are commonly used when performing ethnic rhinoplasty, particularly on Asians or those of of Asian descent. Asian rhinoplasty patients commonly present with a nasal bridge that is relatively low in height, which contributes to the appearance of a broad nose when viewed from the front. Nasal implants can be used to augment the nasal bridge, enhance the shape, and provide finer contouring. In some instances, a previous rhinoplasty may result in a deformity of the nose. Common deformities associated with prior rhinoplasty include a drooping nasal tip and saddle nose deformity. Both of these defects can be corrected through revision rhinoplasty using a nasal implant. When planning nasal reconstruction or rhinoplasty that requires a nasal implant, the surgeon must carefully consider the type of material to be used for implant, as the choice of supportive material is critical to a successful outcome. The surgeon will review the patient’s existing nasal structure and medical history before choosing the material for that particular rhinoplasty. Each type of nasal implant has its own benefits and disadvantages that will be taken into consideration by the surgeon when choosing the implant. Created from the patient’s own body, autogenous cartilage grafts are the most commonly used material for nasal augmentation and are considered the top choice by many plastic surgeons. When using an autogenous cartilage graft, the likelihood of rejection or infection is minimal because the supportive material comes from the patient’s body. Another advantage is that the cartilage can be easily shaped to create a precisely contoured implant. Septal (from the nasal septum) and ear cartilage are commonly used for nasal implants. In some instances, cartilage may be obtained from a donor. Irradiated rib cartilage has been safely used for over 30 years and provides excellent results. For further information on donor and autogenous cartilage implants, please view our page dedicated to cartilage implants. Like cartilage, autogenous bone implants can be used to support the nasal structure and have low infection rates. The popularity of bone grafts have increased in recent years as an alternative to cartilage grafts when addressing major nasal defects; however, cartilage continues to be the leading choice in nasal implants for mo­st plastic surgeons. Medpor is another porous material that can be used for nasal implants. An advantage of Medpor is that it can be very precisely sculpted and contoured for precise fit in the nasal structure. When used in ethnic rhinoplasty or for patients with thick nasal skin, Medpor has one of the lowest infection rates of all implants, making it an excellent choice in certain situations. In comparison to silicone or Gortex, Medpor also integrates better with the patient’s tissue and tends to move around less. When placed by an experienced surgeon, Medpor implants can provide excellent long-term results. In some cases, particularly with ethnic rhinoplasty, septal or ear cartilage may be too soft or weak to provide adequate support. In these instances, a combination of native cartilage and a Medpor implant may be used. Gore-Tex implants, created from a porous material called polytetrafluoroethylene (e-PTFE), are safely used in a variety of medical and cosmetic procedures including rhinoplasty, chin and cheek augmentation, and to fill fine lines and wrinkles. The material is porous, which allows tissue in-growth to occur, creating a stable connection between the nasal structure and graft. The flexible material feels natural under the skin and can be molded into the precise shape required. As with all nasal implants, there is a risk of infection and rejection, but the rates are low and Gore-Tex is generally accepted as a safe implant for use within the body. 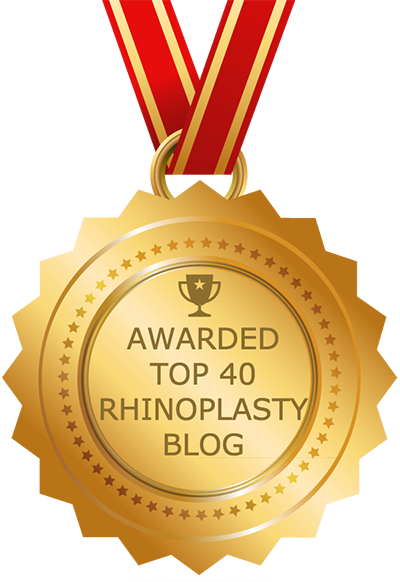 In the past, silicone implants were the most commonly used alloplastic material used in augmentative rhinoplasty. Silicone implants were a popular choice because they could be easily shaped and placed into the nose. Silicon implants do not bond with the body’s tissues, allowing for their easy removal if complications arise. Their lack of integration with underlying structures, however, means that the implants can migrate after placement. They may also have an unnatural, hard feel beneath the skin. In addition, silicon implants are prone to infection, which can cause further damage to the nasal appearance. With the availability of more advanced substances and a preference towards cartilage grafts, silicon implants have fallen out of popularity in recent years; however, there are still instances in which a plastic surgeon may decide that a silicone implant is the best choice for a particular case.